Today I finished this year's batch of blackberry cordial. Last year's was so good, I simply HAD to do more. 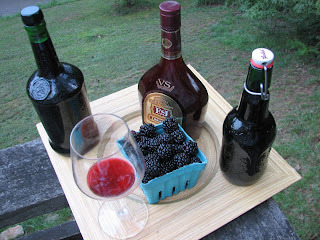 We picked a couple of quarts of blackberries at Crabtree Organic Farms a week ago, and steeped them in brandy. Today I made a simple syrup out of organic cane sugar and added it to the brandy after straining out the berries. Mmmm-wow! It tastes like a light blackberry port. Very nice. The recipe went something like 2 quarts berries, 6 cups brandy, and the syrup (2c sugar + 1c water). Last year I had made the cordial with vodka, but this year we had been given a couple bottles of brandy from a friend, so tried this one out. Not typically a brandy fan, but this is damn good! Having opted for the "it's too hot and muggy now to be outside and drive posts into the ground for tomato plants" option this year in the garden, I've discovered I have been outwitted by a box turtle. A whole thieving gang of them, actually. Last year, I lost a few before I discovered the culprit. A beautiful tomato from the top view would have the bottom entirely missing, unnoticed until picking. Now, they've turned gangbusters. 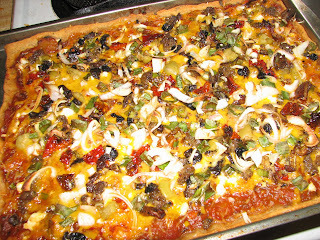 I'm losing half or more of the bigger tomatoes to the turtle bastards, and I'm thinking of turning redneck--turtle soup, anyone? Fortunately, working at an organic farm this year, I'm able to more than make up for the losses. 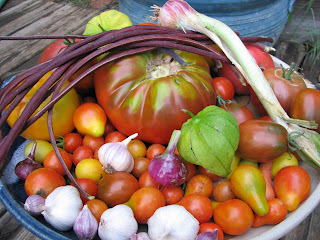 This is a pic of the harvest yesterday: tomatillos, red and yellow pear tomatoes, golden jubilee, black plum (very tasty! ), black from tula, cherokee purple, fox cherry (also very tasty), peacevine cherry, as well as chinese red long beans, royalty purple podded beans, tiny garlics, shallot, and tiny red cipollini onions. There's more unnamed, and cucumbers to pick today to add to the pickle jars already in the fridge.